Children at a Chester school are collecting spoons which will help an international project to save gorillas. 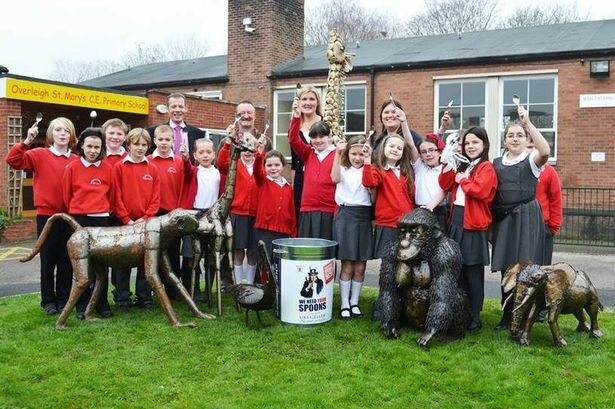 The youngsters at Overleigh St Mary’s CE Primary School in Handbridge are helping the illusionist and self-proclaimed psychic to create a monstrous gorilla statue out of the old cutlery at the British Ironwork Centre in Oswestry . Geller has asked the centre to create the sculpture from a mixture of iron and spoons collected from schools around the country. The gorilla will be unveiled on Saturday, May 17 and then airlifted to Geller’s garden, where it will be a special feature for his charity open days. The Overleigh children are involved with a project called GAFI (Great Ape Film Initiative) and members of the team will provide Geller with one of their new UK Pedal powered cinemas, showcasing a series of films about the conservation of the gorillas. The pedal powered cinema, created by alternative energy pioneers ‘Electric Pedals’, is a portable set of equipment consisting of a DVD and projector, which is powered by pedalling a standard bicycle. These cinemas are taken to the heart of the remotest communities in Africa and South East Asia, to show local people films about the importance of conserving their local environment, in particular the habitats of the Great Apes. The GAFI team recently toured around the North West with a pedal powered cinema and are currently working with 12 Cheshire schools to develop conservation school twinning projects. To donate spoons for the gorillas deposit them in the spoon bank at Overleigh, Christleton or Westminster primary schools or at Sainsbury’s in Chester.